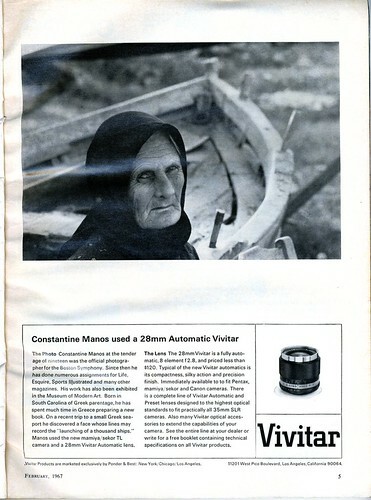 The Auto Vivitar 28mm f/2.8 Chrome Nose is a lens distributed by Ponder and Best (Vivitar) in the 1960s. Modern collectors refer Vivitar lenses such as this as the "Chrome Nose" family because of the distinctive chrome band around the front edge of the lens. There is also a bright silver band located near the base of the lens. Later lenses based on the same mechanical configuration dropped the chrome nose to make room for a built-in lens hood but retained the lower bright silver band, thus becoming known as the bright band family. Both families are believed to have been manufactured by Kino Precision. This page was last edited on 11 October 2018, at 04:42.